The annual Eye Charity 5 road race, organised by Eye Community Runners, was once again a rousing success for all involved. Because of the very hot weather far, which is far from ideal for running, numbers were expected to be slightly reduced. But this wasn’t the case and yet again the local road running community turned out in force to support the event with 142 runners taking part, including many from Eye Community Runners, Yaxley, Bushfield, Ramsey, Thorney and BRJ. 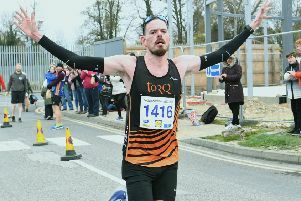 And there was certainly a competitive edge to the race, with James Mogridge of Yaxley Runners continuing his good form. He led from the early stages of the race and crossed the line first in a time of 28.01. Daniel Snipe of Peterborough AC was second with Shaun Walton from Ramsey Runners coming third. For Eye Community Runners, Ben Heron was first over the line in a time of 29.47, which was certainly a relief for Ben, as not only was he being pursued by his brother Alex, but he also had a further 27 of his clubmates chasing him. Louise Blake of Nene Valley Harriers took the ladies race honours in a time of 35.34 with Laura Conway of Vegan Runners second and Lisa Moloney of Eye Community Runners third in a time of 39.28. In addition to the competitive edge to the race, there was the fun and social side to the event as well, with runners such as Paul Barnes completing his first race, and other runners from the local Sweatshop running community taking their first steps into the local running scene.